Clark Hayden is a graduate student trying to help his mother navigate through the loss of his father while she continues to live in their house near Washington DC. With his mother's diminishing mental capacity becoming the norm, Clark expects a certain amount of craziness as he heads home for the holidays. What he couldn't possibly anticipate, though, is that he would find himself catapulted into the middle of a terrorist operation. As the holiday festivities reach a crescendo, a terrorist cell - which happens to be across the street - is activated. Suddenly Clark is discovering things he never knew about deadly chemicals, secret government operations, suspiciously missing neighbors, and the intentions of a gorgeous IRS auditor. Clark's quiet suburban neighborhood is about to become one of the most deadly places on the planet, and it's up to Clark to prevent the loss of hundreds of thousands of innocent lives in the nation's capital. 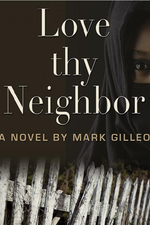 Fast, acerbic, wise and endlessly exciting, Love thy Neighbor marks the unforgettable debut of a startling new voice in suspense fiction. Fill in the Promosimple form to enter. thanks for the giveaway Freda! i hope i get a copy.